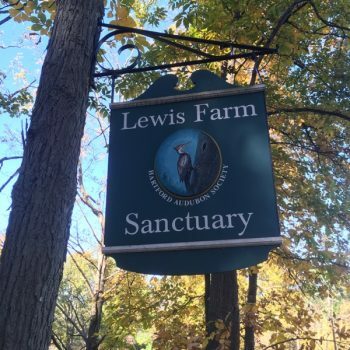 But the thing about Connecticut is that being an old state with a rich history, lots of our sites have a cool story attached to them. Yantic Falls is one such place to be sure. 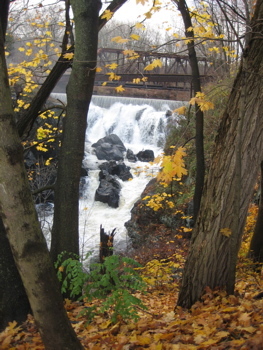 If you don’t know, there seems to be a “Death by leaping” legend to just about every waterfall and river cliff in Connecticut. We even have a Lover’s Leap State Park. At least the legend here at Indian Leap is cooler than the swishy love stories I’ve written about in the past. 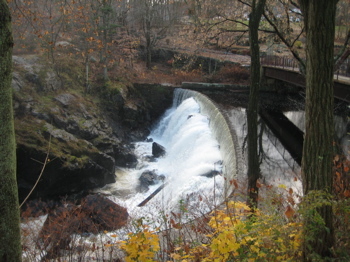 Yantic falls was a favorite encampment of the Mohegan Indians. In 1643 Uncas, Sachem of the Mohegans, led his warriors in a battle against their rival tribe the Narragansetts. During the battle, the Narragansetts were pursued by the Mohegans. Legend has it that a band of Narragansetts, unfamiliar with the territory, unknowingly reached the high treacherous escarpment of the Falls. The Narragansetts, rather than surrender, attempted to leap the chasm. 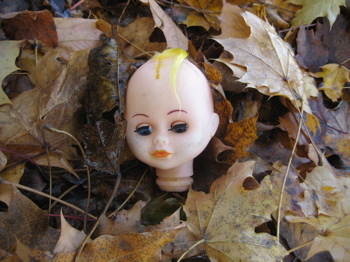 Unsuccessful, they plunged to their deaths into the abyss below. From “Are We There Yet” – which is essentially a Norwich-only version of CTMQ – we get the deeper, cooler story. As the story goes, Miantonomo, sachem of the Narragansetts, led 900 of his warriors in what was to be a surprise attack on the Mohegans at Shetucket, the Mohegan capital. The night before the battle, Mohegan scouts in the area observed the advancing enemy and carried the intelligence back to Uncas who formed a plan. Uncas knew he didn’t have enough warriors to battle Miantonomo but he was a brave chief and would die for his people if need be; if one man could save many then he was willing to make that sacrifice. He told his braves that he would ask Miantonomo to fight one-on-one and if Miantonomo refused, he would drop to the ground as a signal for them to fire arrows into the enemy and then charge them hoping that the surprise would give them the advantage against the higher numbers. Chief Uncas met the Narragansett chief between the lines of battle in the area that is now known as East Great Plain and appealed to him to prevent blood loss between both tribes by a single combat between the two leaders instead. When Miantonomo contemptuously rejected Uncas’ proposal, the Mohegan chief immediately dropped to the ground and the Narragansetts were met with a hail of arrows before Chief Uncas jumped to his feet and led his brave warriors in a charge. Caught totally off-guard, the Narragansetts ran from the charging Mohegans with some fleeing along their familiar route while others, unfamiliar with the territory, unknowingly reached the high treacherous cliffs of Yantic Falls . Rather than surrender, Miantonomo leapt across the gorge and managed to land on the other side, injuring his leg in the process. Others of his tribe attempted to leap the chasm but were unsuccessful and plunged to their death onto the rocks in the abyss below while others simply surrendered and became prisoners of the Mohegans. When the pursuing Uncas arrived at the top of the gorge and saw his enemy hobbling away on the other side, he took a running start, flew over the rapids, and landed safely on the other side. 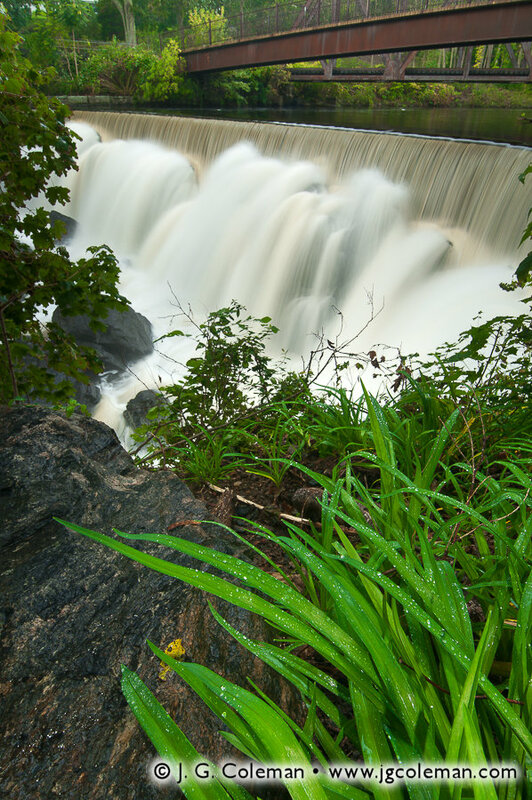 It was an astounding leap that gave the area above the falls its future name and allowed Uncas to catch up to the injured Miantonomo who was then easily overcome and taken as prisoner. Miantonomo was executed and buried in Shetucket, where a marker stands today. But he didn’t live in Connecticut, so we don’t care about him. We’re all about Uncas – who happens to be buried here in Norwich (CTMQ Visit here). 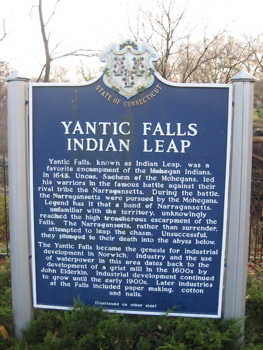 a 150 years after Uncas became the last of the Mohegans (except for the few multi-billionaires who now own the massive Mohegan Sun casino down the road), Yantic Falls became the genesis for industrial development in Norwich. Industrial development continued to grow until the early 1900s. Later industries at the falls included paper making, cotton and nails. Obviously not my picture, but rather, Justin Coleman’s professional shot. The mills harnessed the falls and it’s now sort of half natural. 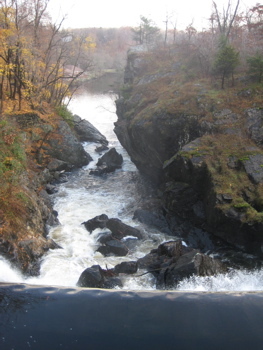 The top is clearly a dammed up portion but after falling a few feet, it appears to be the original natural falls. Sort of unique that way I think. Also unique is the gorge below the falls; something very rare here in Connecticut. But I think the picture is pretty cool in a weird way. I also jumped off Indian Leap!!! This spot is really cool after a few days of freezing weather with this mist freezing on the rocks. I used to live in one of the house on Yantic st. After my brothre passed we moved away from there. However when I went there years later, I felt the richness of history of the area. Still today, I remember I wasn’t allowed over there without an adult. There is a high spiritual energy there, that the ordinary person couldn’t feel. It will forever resound for me. In my early 20’s I went there with friends and we heard drumming in the woods beyond the bridges. We wnet over and looked it had stopped atfer getting to a small clear with a tarp and food pacages laying around.The feel up to that point was awesome!! I will never forget it. This area figures in some of Wally Lamb’s stories. I wanted some story of what had happened there and you made the most precise fact easy to understand. Thanks for sharing. I lived in a house On Yantic st. Until I was 11 years old. We played all over this area (my two brothers, a sister, and myself. You couldn’t drag me down on that wall above the dam now but as children we ran free. I have one poem reminiscent of these times in the n wood. I had lived in Norwich for a little over 20 years from 1978 and had visited Indian Leap as a youth many time. Seeing the pictures brought back many memories. I have a postcard dated 1908 (over 100 years ago) of Indian Falls near Norwich Conn. It was apparently taken from the same spot as one of your pictures above. I am amazed at how much they have in common after this long. One thing is for sure, there was much, much more water there when you took your picture, than 100 years ago. Pretty cool ! Thanks for posting all the information. I lived in Norwich from the time I was born until two years ago ( 17 years ) I had never really visited the falls until my freshman year in highschool at NFA, and even then I never really started hanging out down there untill the begining of my softmore year. Take it from somebody who spent every day down there for at least six hours a day ( usualy the entire day ) no matter what time of year or weather for two and a half years there is SOMETHING special about it. There is an energy there that seems to causes people missing or looking for something in there life there, explorers, artist, musicians, poets and many others to return. Because of the fall I am who I am today. Some of the most defining and influential moments of my life happen’d at or because of the falls. There is something special there besides the beauty when you find it, you will never, ever, forget the feeling. I lived with my family on Sherman St for years, we moved in 1976 after I graduated from NFA. Small world reading this site, pretty cool. I am so curious who wrote they lived at 21 Sherman Street 50 years ago, could it be one of my 8 brothers or sisters, it was on a different site about Indian Leap.